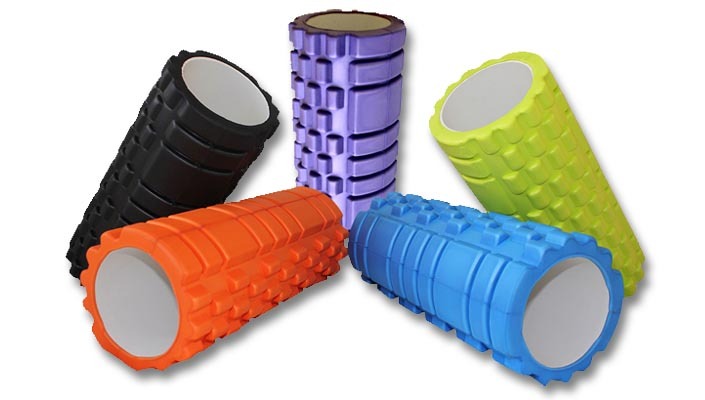 A foam roller is a self-massage tool that can be used pre and post exercise to increase mobility and to help speed up recovery. Used effectively a Foam Roller can help decrease muscle tension and target trigger points which have developed over time through repetitive movement (overuse). When Foam rolling it is important to roll slowly over the area that you are treating, apply gentle pressure at first. The maximum amount of time to spend on one particular area should be around 20 seconds. If you apply to much pressure for too long there is a risk of irritating the area further. Avoid rolling over bony areas and be careful of rolling over a very painful area; too much direct pressure on an already inflamed area could cause further damage. Start from the heel and raise your body off the ground. Roll up the calf then back and then roll side to side. You can use the other leg on top to add additional pressure. When you get to a sensitive spot then hold and rotate your foot through its full range of motion one way and then the other. Start from the knee and keep your legs straight by extending through the heel. Work up the length of the hamstring rolling side to side and up and down. You can roll both legs at the same time or cross one leg over the other to apply more pressure. Roll both glutes by sitting square on the roller. You roll up to the top of the muscle but be careful of your spine. To roll the Glute Medius roll onto the side of your glute and and roll up to the top of the pelvis. 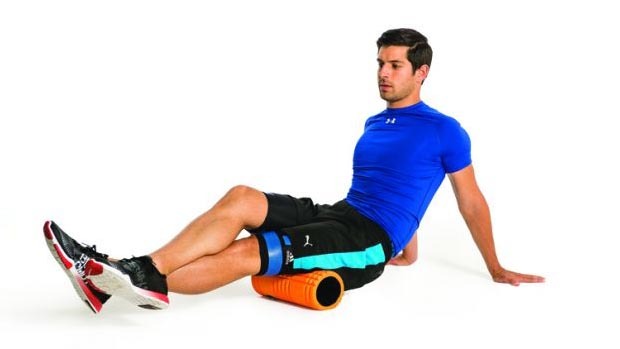 To roll the piriformis (narrow muscle inside the glutes) cross one leg over the knee (seen in the photo) and roll back and forwards on that glute. Start with the roller on the front of your legs just above your knees. Work up to the hips and down to the knee again. If you have your big toes touching and heels turned out and then roll again, this will target different parts of the quad muscles. You can roll one leg at a time with one leg on top of the other. This will add more pressure. Place the roller in the middle of your shoulder blades and lock your hands behind your head. Lift your body up off the floor and keep your elbows high. Then roll from the top of the shoulders and past your shoulder blades. Be careful not to roll directly on to the neck or down to the lower back (lumbar spine) which is a sensitive area and could be damaged if too much pressure is applied.